shelves (and I wasn’t up to mixing some myself), so it was a must-do this year. And I’m glad I did. 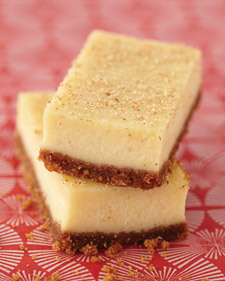 They taste probably how you’d imagine an eggnog cheesecake to taste. Divine. This may only be of use for next year, but if there’s still some eggnog left in your market, you may want to snag it . . .
Preheat oven to 350 degrees. Coat a 9-inch square baking pan with cooking spray. Stir together graham crackers, 3 tablespoons sugar, and the melted butter. Press into bottom of pan. Bake until crust is just brown around the edges, 12 to 15 minutes. Let cool. Meanwhile, beat cream cheese with a mixer on medium speed until fluffy, about 2 minutes. Add the remaining 3/4 cup sugar, the eggs, yolk, eggnog, flour, brandy, vanilla, nutmeg, and salt; beat until smooth. Pour filling over crust. Set pan in a roasting pan, and add enough hot water to come halfway up sides of baking pan. Bake until just set, 40 to 45 minutes. Remove baking pan from water bath, and transfer to a wire rack. Let cool slightly, about 30 minutes. Refrigerate for at least 3 hours or overnight. Cut into 1 1/2-by-3-inch bars. Lightly dust tops of bars with freshly grated nutmeg just before serving. You can refrigerate these bars for up to 5 days (like they would last that long! ).